The cornified stratified squamous epithelium on the dorsal side of the tongue is well developed (thirtysome layers) and consists of the typical layers, except that in the stratum corneum, flattened cells can still be seen. 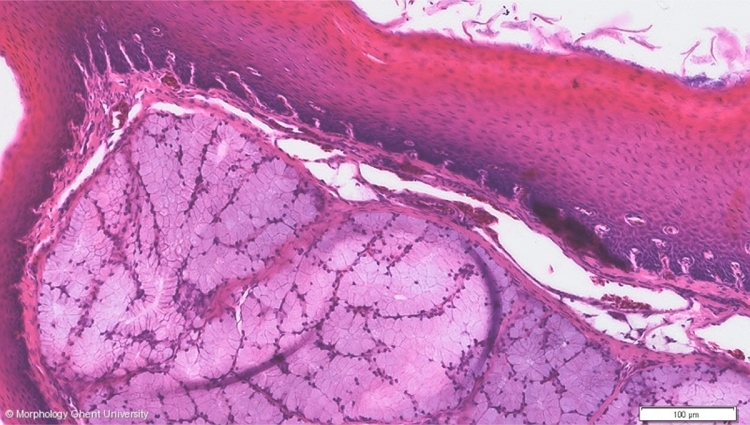 The underlying dermis or lamina propria forms elongated connective tissue papillae. Lateral and ventral, the epithelium is less thick but shows the normal cornification. The salivary glands consists of several lobules. Each lobule consists of a vast concentration of tubular mucus-secreting end pieces. The gland cells are tall columnar cells with a foamy cytoplasm and a flattened basal nucleus.